In August 2013 an article appeared in Endocrine Today entitled Gestational hypothyroxinemia associated with autism occurrence. It referred to a large-scale study published in the Annals of Neurology that revealed mothers with severe hypothyroxinemia (defined as maternal free T4 in the lowest 5th percentile with normal serum TSH) were four times more likely to give birth to a child with autism. I think of this article often and wonder about the madness of a medical system that fails to protect our children. Despite the research showing the potential dangers of thyroid disease in pregnancy there is currently NO routine thyroid testing in pregnancy. I am so passionate about this topic since miscarrying my baby needlessly due to maternal hypothyroidism that I wrote an entire book with thyroid expert Mary Shomon to help women with thyroid disease have healthy pregnancies. Part 3 of our book provides comprehensive checklists of lab tests, optimal ranges, prenatal vitamins, supplements and more so our readers will know even more than their doctors about having healthy pregnancies. A mother named Jessica wrote a comment on my Hypothyroid Mom Facebook page. Jessica has hypothyroidism and her two sons have congenital hypothyroidism. 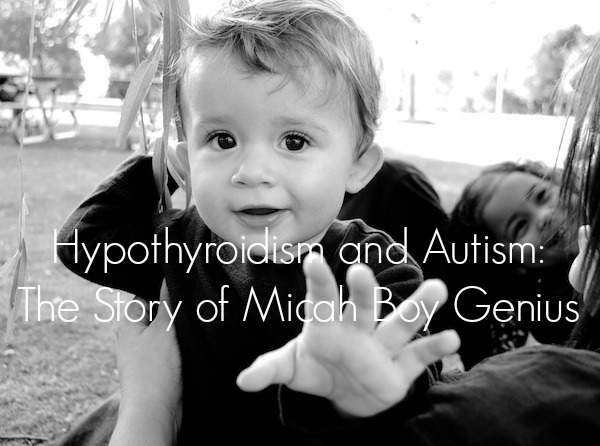 Her son Micah has congenital hypothyroidism and autism. I just knew that I had to hear more of his story. I write Hypothyroid Mom for us the adults with hypothyroidism. However to tell you the truth, I really write Hypothyroid Mom to create change for our children, so they do not suffer the same struggle for proper diagnosis and treatment as us. A child is never too young to be tested for hypothyroidism. Watch your children for signs. You must read Micah’s story and you will be convinced. I suspect I had undiagnosed subclinical hypothyroidism after my third pregnancy, which happened to be an early miscarriage. I struggled with my weight and had all the symptoms of hypothyroidism, but my doctors told me my labs were fine. I believed them. I went on with my life and attributed my health concerns with being stressed out with the many responsibilities of a single mother. After I married my husband in 2007, we tried to get pregnant for 8 months before we were finally at the point of giving up. We both were seen for fertility reasons and then I started taking a prenatal vitamin and prayed for a positive pregnancy test. A month later, we got those 2 little blue lines. I was pregnant with my second son, Micah. I wasn’t diagnosed with hypothyroidism and treated until after I had my youngest son in 2012. Micah is my third child. He was born in February of 2009 and within 26 hours of birth, he had his heel pricked for the standard newborn screening. The results? Normal. His growth and health told a different story. Each time we visited his pediatrician he had something going on. He was hospitalized for jaundice after his first well-child visit and then for the next 2 years he would develop a series of medical issues that were unexplained. He had poor feeding, poor growth, constipation, and choking episodes. I remember feeding his solids at 10 months and his eyes would roll back in his head with a terrified look on his face like he was choking. It was very scary. He had horrible GERD, so we assumed the choking episodes were due to this. He slept constantly and while this was great for us, we didn’t realize it was a sign of congenital hypothyroidism (CH). After his 1-year well child visit is when we really saw a decline in his health. He stopped eating. If he would eat it would be salty foods or processed baby meals. His nose was orange at his first birthday party and I assumed it was from too many carrots. Knowing what I know now, it was probably a sign of liver dysfunction. He lost all vocabulary and began many OCD and autistic behavior between 1 and 2 years of age. He lost eye contact and his anxiety in public was at its worst. Everywhere he went there was “stranger danger!” Autism still wasn’t on my radar. But, something still wasn’t “right” with my son. We took him to his pediatrician and told him we were concerned about his health and developmental delays. His suggestion, “Wait and see.” Something told me this wasn’t a good idea. So, we sought out a second opinion. Within 24 hours we got a call telling us he needed to be seen at a pediatric endocrinologist. What?! Why?! His TSH was 11. After confirmation from a pediatric endocrinologist, Micah was diagnosed with unspecified hypothyroidism at age 2 years, 7 months old. He began treatment with Synthroid that same day. He also underwent growth hormone stimulation testing due to his low growth hormone levels last January and he’s being monitored for his short stature at this time. We suspected he had congenital hypothyroidism (CH) and it was left undiagnosed. These suspicions were confirmed when our son Eli was born with CH in 2012 and had a TSH value of 35. However after finally receiving Micah’s newborn screen results, those suspicions were solidified. His TSH value at birth was 30. You see in 2009, the newborn screen cut-off in our state for borderline positive congenital hypothyroidism (CH) was 33, so technically his physician wasn’t notified. Also, I found studies out there about the possible link between congenital hypothyroidism and autism. I decided to switch to Armour for my own hypothyroidism two months after taking Levothyroxine because I was still having symptoms and I wanted to see if it would be beneficial. I’m so glad I did. Because I felt so much better. I asked Micah and Eli’s endocrinologist to switch them to Armour but he refused. So, I asked their PCP to do the switch. He did and it has truly made a difference. Please note this is our story. I can only share with you what has worked for us. Every person is different in terms of which treatment is right for them so this isn’t necessarily right for everyone, but it’s worth it to discuss the thyroid medication options with your doctor. Micah grew a whole inch in less than 5 months on Armour! He barely grew that much in an entire year on Synthroid. He seems more active, less tired, and he seems to be learning new concepts a lot easier. He is still non-verbal, but because of his unique dual diagnosis, we are really unsure what part of that is due to the failure to diagnose congenital hypothyroidism (CH) and what part is autism. Seeing the great results of Armour, the pediatric endocrinologist concurs with our decision and was happy to continue monitoring Micah’s progress. As for Eli, he began treatment by 6 weeks after his TSH dropped from 35 to 12.27 on its own. He hasn’t suffered any of the health problems Micah dealt with. He has met all developmental milestones, is verbal and beginning to speak in 2 word sentences and has no red flags for ASD. THREE. This value stood between my son being treated early for congenital hypothyroidism and his symptoms being ignored. My advice is, DON’T WAIT. EVER. Find another doctor or specialist. If your child isn’t growing or is experiencing any symptoms of congenital hypothyroidism or developmental delays, please ask your physician for a thyroid panel. Not because of fear of them being diagnosed with autism (my son is my joy), but because they deserve the best chance at health and development. A diagnosis of autism isn’t a tragedy. In fact, the prognosis of Autism Spectrum Disorder (ASD) can be excellent. However, a failure to diagnose congenital hypothyroidism can be devastating and the brain damage can be permanent. DON’T WAIT AND SEE. Hi, my name is Sherry and I was diagnosed with Congenital Hypothyroidism due to Thyroidism one month after my birth in 1951. At the time, I was the youngest baby to be diagnosed before the age of 3 months. My mother was a nurse and observed that I was not eating, was lethargic, and just “didn’t look right” . My pediatrician had just attended a pediatric endocrine clinic at John Hospital offered by Dr. Robert Blizzard. He tested for T3 and T4 in my blood and found them to be very low. Testing did not include at that time. My mom had gained 50+lbs during her pregnancy. When I moved to Virginia as an adult, I was told, by an endocrinologist that children are born without a Thyroid so the original diagnosis was incorrect and there was no reason why I could not more take Synthroid I gained 20 lbs, was constantly tired, and I gained 20 lbs in less than a month.. When I called my doctor to advise him that the Synthroid did not appear to be working He refused comply with my request, he terminate the call. I have had the same experience with several doctors. I am 68 and on a fixed income so paying for Armour out-of pocket is a financial strain as Medicare has discontinued coverage as “not necessary”. I am applying for Medicare for some relief. Thank you for the all the information on this site. Hi! My name is Jennifer covey have about the same as Jessica & her son Mica. My son Sebastian has Autism & Asthma. Myself have hypothyroid problem since birth only my grandma new at that time 4/6/74.Doctorsat that time they didn’t know what it was.I have applied for disability 3 x times was denied.im working on appeal. I feel that my thyroid problem gave this to my son Sebastian .My Sebastian & myself has been staying in a motel here in Orlando fl. We are currently with out an a place apartment. We’ve been here with my friend but friend died of illness.Were out of money motel is $276wk. We need of help. I know how she feels. A mom doing her best for her child. we are at howard Vernon motel in Orlando fl. I have been diagnosed with both myself. I am also living with a vitamin D deficiency. I am on 75 mg of Armour Thyroid a day. I have to pay for it myself, but I can afford it right now. My doctor recommended I take 4000 IU a day, so i am trying to increase my dosage from the 2000 my endo prescribed. The vitamin D deficiency tends to give me a bad headache, depression and fatigue. The headache feels like my head is being squeezed in a vice, with the pain most pronounced at my temples and the top of my head. I am also learning ways to deal with my autism (I am in support level 1 of the autism spectrum) and manage my anxiety. Hi Crystal, It is good to have you at Hypothyroid Mom. I have this article with tips for optimizing vitamin D.
My grandson has hypothyroidism, he’s sees an endocrinologist but they won’t give him medicine, he’s very moody and overweight, he has aspergers autism, his mom passed away and she had thyroid disease and I have hypothyroidism and take synthroid, I don’t understand why they won’t give meds.